Background: Early detection of airflow obstruction is particularly important among young adults because they are more likely to benefit from intervention. Using the forced expiratory volume in 1 s (FEV1) to forced vital capacity (FVC) (FEV1/FVC) <70% fixed ratio, airflow obstruction may be underdiagnosed. The lower limit of normal (LLN), which is statistically defined by the lower fifth percentile of a reference population, is physiologically appropriate but it still needs a clinical validation. Methods: To evaluate the characteristics and longitudinal outcomes of subjects misidentified as normal by the fixed ratio with respect to the LLN, 6249 participants (aged 20–44 years) in the European Community Respiratory Health Survey were examined and divided into three groups (absence of airflow obstruction by the LLN and the fixed ratio; presence of airflow obstruction only by the LLN; presence of airflow obstruction by the two criteria) for 1991–1993. LLN equations were obtained from normal non-smoking participants. A set of clinical and functional outcomes was evaluated in 1999–2002. Results: The misidentified subjects were 318 (5.1%); only 45.6% of the subjects with airflow obstruction by the LLN were also identified by the fixed cut-off. At baseline, FEV1 (107%, 97%, 85%) progressively decreased and bronchial hyperresponsiveness (slope 7.84, 6.32, 5.57) progressively increased across the three groups. During follow-up, misidentified subjects had a significantly higher risk of developing chronic obstructive pulmonary disease and a significantly higher use of health resources (medicines, emergency department visits/hospital admissions) because of breathing problems than subjects without airflow obstruction (p<0.001). Conclusions: Our findings show the importance of using statistically derived spirometric criteria to identify airflow obstruction. In the present study, data from a large cohort of young adults (20–44 years), followed for 9 years during the 1990s as part of the European Community Respiratory Health Survey (ECRHS) I, were used to investigate the clinical and functional characteristics and longitudinal outcomes of the subjects identified as “normal” by the fixed ratio but abnormal by the LLN. For this purpose, LLN equations for young adults were obtained from the normal non-smoking participants in the ECRHS I. The design of the ECRHS I and ECRHS II has been described in details elsewhere.17 18 In the ECRHS I, an international multicentre study on respiratory diseases, carried out in 1991–1993 on random samples of young adults aged 20–44 years, each participant was sent a brief screening questionnaire (stage 1) and, from those who responded, a random sample was selected to undergo a more detailed clinical examination (stage 2). In addition, a “symptomatic sample”, formed by subjects who had reported waking with shortness of breath, asthma attacks or use of asthma medication at stage 1, was studied. In the ECRHS II, a follow-up study of the participants in stage 2 of the ECRHS I, performed in 1999–2002, subjects were invited to undergo the same clinical examination as in the first survey. A total of 12 254 subjects out of 15 705 participants in the ECRHS I stage 2 from 25 European centres, from the random and symptomatic samples, were eligible for the present study; 6249 of these subjects attended the second survey and had lung function measurements fulfilling the ATS criteria for reproducibility. The LLN equations for FEV1/FVC were obtained from 1227 men and 1309 women who participated in the ECRHS I (1991–93) and who were defined as “normal” according to Johannessen et al (see the appendix, available online).19 Two level linear regression models,20 with subjects (level 1 units) nested into centres (level 2 units), were used to calculate the LLN equations separately in men and women. Both models had the FEV1/FVC ratio as the dependent variable, a random intercept term at level 2 and age as a fixed effect. A Markov chain Monte Carlo method (Gibbs sampling) was used to estimate the model parameters. The LLN equations were computed as predicted FEV1/FVC (from the fixed part intercept and slope coefficient) – 1.645 × square root of the sum of the level 1 and level 2 variances, in order to identify the 5% of the “normal” subjects with the lowest values in the reference population. Figure 1 The lower limit of normal (LLN) of the ratio of forced expiratory volume in 1 s to forced vital capacity (FEV1/FVC) normally decreases with age. The downward sloping lines are the LLN equations for the FEV1/FVC ratio, calculated according to age and gender from the ECRHS I data. The horizontal line indicates the 70% fixed cut-off. LLNfemales = 85.101−0.287 × age. The LLN equations were obtained using MLwiN software (Multilevel Models Project, Institute of Education, London, UK). The subjects considered in the analysis were divided into three groups according to the presence of airflow obstruction at baseline (ECRHS I), as defined by the LLN and the fixed cut-off: (1) absence of airflow obstruction by both criteria; (2) presence of airflow obstruction by the LLN but absence of the condition according to the fixed cut-off (“misidentified subjects”); and (3) presence of airflow obstruction by both criteria. No subject was classified with airflow obstruction by the fixed cut-off but without the condition by the LLN at the ECRHS I. Subjects with the presence of airflow obstruction by the LLN but absence of the condition according to the fixed cut-off were defined as “misidentified”. Subjects were further classified according to the presence of a self-reported diagnosis of asthma during their lifetime at the ECRHS II (positive answer to both questions “Have you ever had asthma?” and “Was this confirmed by a doctor”). A set of biometric, clinical and functional characteristics measured at baseline was taken into account: gender, age, ever smoking during lifetime, FEV1% predicted and FVC% predicted,21 bronchial hyperresponsiveness (BHR),22 high total IgE (>100 kU/l), IgE sensitisation, chronic cough or phlegm (see the online appendix for a more detailed description of these variables). A set of clinical and functional outcomes was evaluated at the second survey (ECRHS II): FEV1 <80% predicted (9 year incidence among those with an FEV1 ⩾80% at baseline); chronic cough or phlegm (9 year incidence among those without the symptom at baseline); self-reported medication use because of breathing problems in the past 12 months; hospital services utilisation (ie, at least one emergency department visit and/or one hospital admission) because of breathing problems during the follow-up (evaluated by the rate of occurrence of the first emergency department visit/hospital admission). The distribution of the biometric, clinical and functional characteristics considered in the analysis was compared among the misidentified subjects and those identified with or without airflow obstruction by both criteria at baseline (ECRHS I). Pearson’s χ2 test, t test on the equality of means and the Wilcoxon rank sum test were used when appropriate. No correction for multiple testing was performed. The outcomes at the ECRHS II were compared among the three groups of subjects using two level regression models,20 with subjects (level 1 units) nested into centres (level 2 units). The models had the outcome of interest as the dependant variable, a random intercept term at level 2 and two dichotomous indicators of the presence/absence of airflow obstruction as defined by the two criteria at baseline (misidentification with the fixed cut-off = reference category) as fixed effects. Statistical analysis was performed using STATA software (StataCorp, College Station, Texas, USA). Of the 6249 young adults, 318 (5.1%) were classified as having airflow obstruction only by the LLN and 267 (4.3%) by both the LLN and the 70% fixed cut-off; therefore, only 45.6% of subjects with airflow obstruction by the LLN were also identified by the fixed cut-off. The main characteristics of the subjects identified with or without airflow obstruction by both criteria, or misidentified by the fixed cut-off, are described in table 1. The misidentified subjects were significantly younger, had a significantly higher percentage of females, a significantly lower FEV1% predicted, a significantly higher level of BHR, a significantly higher percentage of individuals with high total IgE (>100 kU/l), IgE sensitisation, chronic cough or phlegm, or a self-reported diagnosis of asthma than those without airflow obstruction. Compared with those with airflow obstruction defined by both criteria, the misidentified subjects were significantly younger, had a significantly higher percentage of females, a significantly lower level of exposure to tobacco smoke, a significantly higher FEV1% predicted, a significantly lower level of BHR and a significantly lower percentage of individuals with IgE sensitisation or asthma. During follow-up, the 9 year incidence of FEV1 <80% predicted and of chronic cough or phlegm were significantly higher among the misidentified subjects at baseline than among those without airflow obstruction by both criteria (table 2). The proportion of subjects who reported medication use because of breathing problems in the past 12 months at the ECRHS II, and the rate of utilisation of hospital services because of breathing problems during the follow-up, were also significantly higher among the misidentified subjects at baseline than among those without airflow obstruction. The incidence of FEV1 <80% and the rate of utilisation of hospital services because of breathing problems during follow-up were not significantly different between the misidentified subjects and those with airflow obstruction (table 2). Considering separately the 5235 subjects without a self-reported diagnosis of asthma during their lifetime, only 34.7% of subjects with airflow obstruction by the LNN were also identified by the fixed cut-off. In the online appendix, tables 1 and 2 were replicated for both subjects with and without asthma (see tables A1–A4). During follow-up, among subjects without asthma, apart from the incidence of FEV1 <80% and the rate of utilisation of hospital services because of breathing problems, the proportion of subjects who reported medication use because of breathing problems in the past 12 months at the ECRHS II was not significantly different between the misidentified subjects at baseline and those with airflow obstruction by both criteria. Our study shows that the 70% fixed cut-off identifies less than 50% of young subjects who have evidence of airflow obstruction using the LLN criteria. Because self-reported lifetime asthma could be a rather arbitrary diagnosis, and in young adults asthma and COPD can be exceedingly difficult to distinguish, our primary analysis included all subjects. Considering only subjects without a self-reported diagnosis of asthma during their lifetime, this percentage declines to about one-third, showing that the use of the LLN could identify subjects likely to suffer from COPD at an earlier stage than the fixed cut-off. Our results confirm an unacceptably large underdiagnosis of airflow obstruction in young adults, particularly among females, when using the 70% fixed cut-off. Our large cohort of young adults followed for 9 years allowed us to describe the baseline characteristics and longitudinal outcomes in subjects who were misidentified as normal with the fixed cut-off. Unfortunately, there is no gold standard for COPD. The hallmark of the disease is the presence of airflow obstruction, but subjects may have obstruction in the absence of COPD. Clinical findings, including history and exposure to risk factors (occupational hazards, tobacco smoke and other noxious inhalant), can help the diagnosis of COPD. COPD is generally a progressive disease, especially if a patient’s exposure to noxious agents continues. Our results document that, at baseline, subjects misidentified as normal with the fixed cut-off seem to be an intermediate group between normality and COPD. In fact, BHR progressively increased and FEV1 progressively decreased from subjects without airflow obstruction to those with airflow obstruction by both criteria, through to those misidentified as normal. When we considered only misidentified subjects without self-reported asthma, exposure to tobacco smoke also progressively increased across the three groups. Moreover, in our misidentified subjects, the presence of chronic cough and phlegm was similar to that in subjects with airflow obstruction. Until now, how the different definitions of airflow obstruction relate to outcomes has been studied only in a cohort from an elderly population in which the outcomes were death and COPD related hospitalisation during follow-up.14 Even if outcomes are more difficult to establish and to standardise in young subjects than in the elderly, the prognostic implication of the different criteria is crucial for the practice of medicine. We chose FEV1 <80% predicted which is the cut-point that separates mild COPD from the more severe forms of the disease and the presence of chronic cough or phlegm as the study outcomes9; moreover, we considered medication use and hospital services utilisation, which are commonly considered in epidemiological studies.15 With aging, misidentified subjects were at a significantly higher risk of suffering from chronic cough or phlegm and of developing moderate to severe airflow obstruction suggestive of COPD (ie, FEV1 <80% predicted) than subjects without airflow obstruction. Remarkably, the misidentified subjects were at a significantly higher risk of using medication because of breathing problems in the past 12 months at the end of follow-up and of using hospital services because of breathing problems during follow-up than subjects without airflow obstruction. Moreover, they presented a similar proportion of subjects with chronic cough and phlegm and a similar rate of utilisation of hospital services because of breathing problems during the follow-up to subjects with airflow obstruction by both criteria at ECRHS I. When we considered only the misidentified individuals without self-reported asthma, the proportion of subjects who reported medication use because of breathing problems in the past 12 months at the end of follow-up was also similar to that of subjects with airflow obstruction by both criteria. The currently available opportunities for the management of COPD make an early diagnosis particularly important. Bronchodilator therapy improves dyspnoea, exercise endurance and health status; at present, the most intriguing question is whether maximal sustained bronchodilation in patients with COPD may also result in positive long term effects.26 The ongoing results of the UPLIFT clinical trial, assessing the long term functional impact of tiotropium in COPD, will elucidate the role that pharmacological treatment can play in affecting the course of the disease.27 To date, the only successful intervention shown to conclusively attenuate the loss of lung function over time is smoking cessation. It has recently been well documented that the diagnosis of smoking related airflow obstruction increases the efficacy of smoking cessation advice in affected subjects.28 29 Thus implementation of LLN in clinical practice may contribute to significant advances in the treatment of the disease and prevention of its complications. The intrinsic limitation of using the LLN criteria is its dependency on the prediction equations and on the reference population from which the prediction equation has been drawn. Ideally, the prediction equation should be derived from measurements obtained in a representative sample of healthy subjects from a general population as we have done or, secondly, in a large group of volunteers. Currently, the ATS/ERS committee does not recommend any specific set of equations to be used in Europe but it suggests the need for a new Europe-wide study to derive updated reference equations. At variance, software and hardware have now changed the way of laboratory testing and there is no longer the need for manual, time consuming calculation of predicted values, as even inexpensive spirometers can have predicting equations and statistically derived LLN built in. A limitation to our study is that the GOLD criteria recommend the use of a post-bronchodilator spirometry test. However, we used pre-bronchodilator values because we have these values for only a very small proportion of subjects. It is possible that post-bronchodilator values would have varied less between the two definitions of airflow obstruction; how this change could affect outcomes is unclear.4 5 13 30 Another limitation is that that the LLN equations were calculated from a group of “normal” subjects, some of whom were also considered in the analysis (22.5% of the members of the cohort). However, the aim of our analysis was not to define a new LLN for the European general population but to compare two different criteria for identification of airflow obstruction. In conclusion, our findings show the importance of using statistically derived spirometric criteria to identify airflow obstruction. Thus we provide powerful support for the view that the criteria for the screening of airflow obstruction should be changed in order to avoid the risk of not identifying part of the population who is likely to benefit from early intervention.35 We strongly agree with Falaschetti et al in recommending that international scientific organisations return to evidence based medicine and revise their COPD guidelines.36 The reasons of simplicity and ease of remembrance advanced by many international opinion leaders seem unimportant compared with the objective of being able to properly detect airflow obstruction. A list of the participants in the coordinating centre, the steering committee for the ECRHS II, the list of principal investigators and senior scientific team, and the centres taking part at their own expense can be found online only.
. Global strategy for the diagnosis, management, and prevention of chronic obstructive pulmonary disease: NHLBI/WHO Global Initiative for Chronic Obstructive Lung Disease (GOLD) Workshop summary. Am J Respir Crit Care Med 2001;163:1256–76.
. Standards for the diagnosis and treatment of patients with COPD: a summary of the ATS/ERS position paper. Eur Respir J 2004;23:932–46.
. Strategies for screening for chronic obstructive pulmonary disease. Respir Care 2003;48:1194–201.
. Risk of over-diagnosis of COPD in asymptomatic elderly never-smokers. Eur Respir J 2002;20:1117–22.
. Spirometric criteria for airway obstruction: Use percentage of FEV1/FVC ratio below the fifth percentile, not <70%. Chest 2007;131:349–55.
. Case definitions for chronic obstructive pulmonary disease. COPD 2006;3:95–100. Global Initiative for Chronic Obstructive Lung Disease (GOLD). Global strategy for the diagnosis, management and prevention of chronic obstructive pulmonary disease, 2007. http:/www.goldcopd.com (accessed 10 October 2008).
. Assessment of ventilatory abnormality in the asymptomatic subject: an exercise in futility. Thorax 1966;21:445–9.
. Predicted values: how should we use them? Thorax 1988;43:265–7.
. Chronic obstructive pulmonary disease in the older adult: what defines abnormal lung function? 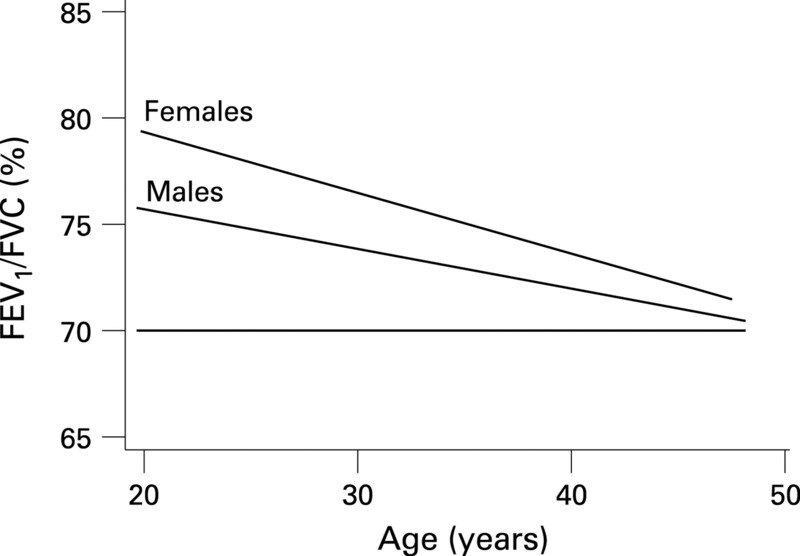 Thorax 2007;62:237–41.
. An international survey of chronic obstructive pulmonary disease in young adults according to GOLD stages. Thorax 2004;59:120–5.
. Incidence of chronic obstructive pulmonary disease in a cohort of young adults according to the presence of chronic cough and phlegm. Am J Respir Crit Care Med 2007;175:32–9.
. Feasible and simple exclusion criteria for pulmonary reference populations. Thorax 2007;62:792–8.
. Multilevel statistical models, 3rd Edn. London: Edward Arnold, 2003.
. Symbols, abbreviations and units. Working Party Standardization of Lung Function Tests, European Community for Steel and Coal. Eur Respir J Suppl 1993;16:85–100.
. Analysis of binary outcomes in longitudinal studies using weighted estimating equations and discrete-time survival methods: prevalence and incidence of smoking in an adolescent cohort. Stat Med 1999;18:2655–79.
. COPD guidelines: the important thing is not to stop questioning. Am J Respir Crit Care Med 2007;176:527–8.
. Is sustained pharmacologic lung volume reduction now possible in COPD? Chest 2006;129:501–3.
. Clinical trial design considerations in assessing long-term functional impacts of tiotropium in COPD: the UPLIFT trial. COPD 2004;1:303–12.
. Smokers with airway obstruction are more likely to quit smoking. Thorax 2006;61:869–73.
. Small airway function improvement after smoking cessation in smokers without airway obstruction. Am J Respir Crit Care Med 2006;174:853–7.
. Defining chronic obstructive pulmonary disease... and the elephant in the room. Eur Respir J 2007;30:189–90.
. GOLD stage I is not a COPD risk factor. Thorax 2007;62:1107.
. What defines abnormal lung function? Thorax 2007;62:1107.
. Definition of COPD GOLD stage I. Thorax 2007;62:1107–8.
. Authors’ reply. Thorax 2007;62:1108–9.
. Conflicting definitions of airways obstruction: Drawing the line between normal and abnormal. Chest 2007;131:335–6.
. Diagnosis of COPD. Thorax 2007;62:924–5. Funding: The coordination of the ECRHS II was supported by the European Commission, as part of their Quality of Life Programme. Funding for the individual centres is listed at www.ecrhs.org. All funds were used during the collection of data. The study design, the analysis and interpretation of data, the writing of the report and the decision to submit the paper for publication were completely independent of these funds. This study was in part supported by the Italian Medicines Agency (AIFA) within the independent drug research program, contract No FARM5JYS5A”.